(CNN) -- German police late Thursday backed away from earlier assertions that a teen posted warnings on a German-language Web site before killing 15 people in a shooting rampage. 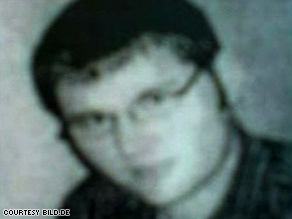 German shooter Tim Kretschmer, 17, began the killing spree at his old school. Police spokesman Gabor Sipos said investigators now have doubts about whether Tim Kretschmer posted he was "fed up with this bloody life" and was going to take a weapon to his old school and "give them hell." Kretschmer killed 12 people at his former school in Winnenden, Germany, on Wednesday and took three more lives elsewhere before killing himself, police said. Earlier Thursday, authorities quoted postings from the Web site, krautchan.net, that they attributed to Kretschmer, saying they had two independent sources who had information that the messages appeared on the site before the killings. But later, Sipos said police were questioning the two teenagers who claimed they had seen the postings prior to the rampage and that investigators had found no evidence on Kretschmer's computer that he might have posted such entries. Sipos also said investigators were talking with the U.S.-based Internet service provider that runs the server that hosts krautchan.net. A message on the Web site denied that any such messages had appeared there. "No killing spree was announced here," the message on krautchan.net said. The message also said the server was having trouble dealing with recent traffic and was going off line until the furor died down. "There's nothing to see anyway, since the German press was unfortunately fooled (and probably not for the first time either) by a forgery," the posting said. "Maybe he visited the site, but he definitely didn't write the post that went through the news, because that one never existed," the posting on krautchan.net said. CNN was unable to reach the owner or owners of krautchan.net because they have registered with DomainsByProxy, which masks their real identities. Earlier, Heribert Rech, interior minister of the state of Baden-Wurttemberg, quoted the postings attributed to Kretschmer as saying, "Everyone laughs at me. No one recognizes my potential. I mean this seriously." "I have got a weapon here and tomorrow I am going to go to my former school and give them hell. Maybe I would escape, keep your ear to the ground. You'll hear from me tomorrow morning. Just notice the name of the place, Winnenden. Don't say anything to the police," Rech quoted. He told reporters Thursday that media reports indicate a teenager from Bavaria who was chatting with the author of those comments on the Internet reported the conversation to his father, who was a reporter. The youth who was reading the postings didn't take the messages seriously, Rech said, and responded "LOL," or "laughing out loud." "I need to see some pictures before I believe it," the teenager added, according to Rech. Police discovered Kretschmer began undergoing treatment for depression at a clinic in April last year, then attended outpatient sessions, which he stopped attending at some point, said Rech. Police also are looking into whether a law was broken, allowing Kretschmer to access the pistol he allegedly used in the shooting. German law mandates that legally purchased weapons be kept in places that are inaccessible to anyone who isn't the license-holder. Kretschmer's father was a gun club member who owned 15 weapons. Rech said 14 of the father's weapons were locked in a cabinet, but one was kept in a bedroom. Another official at the briefing warned that the shooting spree could spark copycat crimes. State police Chief Erwin Hetger said authorities have received six threats, which were being investigated and taken "very seriously." "We have indicated to our police stations that they should get in touch with all the schools ... to go to the schools and to participate ... given these recent events," Hetger said. He said intervention teams were at the Winnenden school two minutes after police received the alarm, and he believed they helped prevent additional deaths. Michelfelder said Kretschmer may have planned to confine his attack to the school but the prompt action of teachers locking down their classrooms and the arrival of police -- who exchanged fire with him -- forced him to flee. Security at German schools has been an issue in the past. In November 2006, an 18-year-old former student strapped explosives to his body and went on a rampage at a middle school in western Germany, shooting and wounding six people -- most of them students -- before killing himself. In July 2003, a 16-year-old student shot a teacher before taking his own life at a school in the southern German town of Coburg. A year earlier, 18 people were killed when an expelled student went on a shooting spree at his school in eastern Germany.